Except for a few brief detours in chapter 1, we considered mostly linear equations. Linear equations suï¬ƒce in many applications, but in reality most phenomena require nonlinear equations. Nonlinear equations, however, are notoriously more diï¬ƒcult to understand than linear ones, and many strange new phenomena appear when we allow our equations to be nonlinear. Not to worry, we did not waste all this time studying linear equations. Nonlinear equations can often be approximated by linear ones if we only need a solution â€œlocally,â€� for example, only for a short period of time, or only for certain parameters. Understanding linear equations can also give us qualitative understanding about a more general nonlinear problem. The idea is similar to what you did in calculus in trying to approximate a function by a line with the right slope. While the solution to the linear equation is not exactly what we were looking for, it is rather close to the original, as long as the angle is small and the time period involved is short. You might ask: Why donâ€™t we just solve the nonlinear problem? Well, it might be very diï¬ƒcult, impractical, or impossible to solve analytically, depending on the equation in question. We may not even be interested in the actual solution, we might only be interested in some qualitative idea of what the solution is doing. For example, what happens as time goes to inï¬�nity? The way we will analyze the system is very similar to Â§ 1.6, where we studied a single autonomous equation. The ideas in two dimensions are the same, but the behavior can be far more complicated. As in Â§ 3.1 we draw the phase portrait (or phase diagram), where each point corresponds to a speciï¬�c state of the system. We draw the vector ï¬�eld given at each point by the vector . And as before if we ï¬�nd solutions, we draw the trajectories by plotting all points for a certain range of . The phase portrait with some trajectories is drawn in Figure 8.1. Figure 8.1: Phase portrait with some trajectories of , . From the phase portrait it should be clear that even this simple system has fairly complicated behavior. Some trajectories keep oscillating around the origin, and some go oï¬€ towards inï¬�nity. We will return to this example often, and analyze it completely in this (and the next) section. In other words, the points where both and . The critical points are where the behavior of the system is in some sense the most complicated. 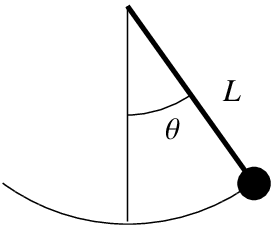 If is zero, then nearby, the vector can point in any direction whatsoever. Also, the trajectories are either going towards, away from, or around these points, so if we are looking for long term behavior of the system, we should look at what happens there. Compare this discussion on equilibria to the discussion in Â§ 1.6. The underlying concept is exactly the same. In Â§ 3.5 we studied the behavior of a homogeneous linear system of two equations near a critical point. 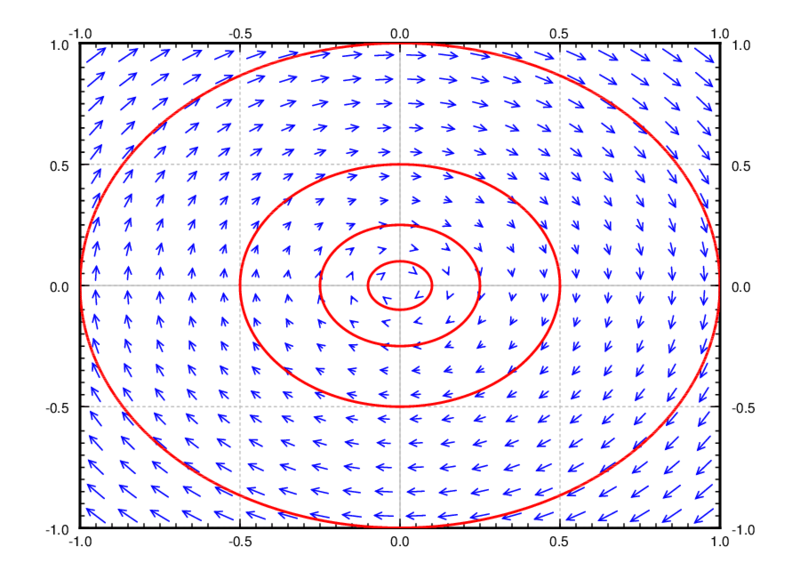 For a linear system of two variables the only critical point is generally the origin . Let us put the understanding we gained in that section to good use understanding what happens near critical points of nonlinear systems. Figure 8.2: Phase diagram with some trajectories of linearizations at the critical points (left) and (right) of , . The phase diagrams of the two linearizations at the point and are given in Figure 8.2. Note that the variables are now and . Compare Figure 8.2 with Figure 8.1, and look especially at the behavior near the critical points. to the vector ï¬�elds below. Justify. Exercise 8.1.3: Find the critical points and linearizations of the following systems. Exercise 8.1.4: For the following systems, verify they have critical point at , and ï¬�nd the linearization at . c) , , where , , and all ï¬�rst partial derivatives of and are also zero at , that is, . Exercise 8.1.5: Take , . a) Find the set of critical points. b) Sketch a phase diagram and describe the behavior near the critical point(s). c) Find the linearization. Is it helpful in understanding the system? Exercise 8.1.6: Take , . Exercise 8.1.101: Find the critical points and linearizations of the following systems. Exercise 8.1.104: Any two-dimensional non-autonomous system , can be written as a three-dimensional autonomous system (three equations). Write down this autonomous system using the variables , , . 1Named for the German mathematician Carl Gustav Jacob Jacobi (1804â€“1851).